Since the FLAK is done and the SFC Shirt Tail is a long, slow knit, I knew there would be no way to keep something new off the needles. Playing with starting a FLAK for hubby or joining in with the Marina Fair Isle knit. I'll be looking this cold, rainy day at what I have in the stash that will work for Marina and what I would need. 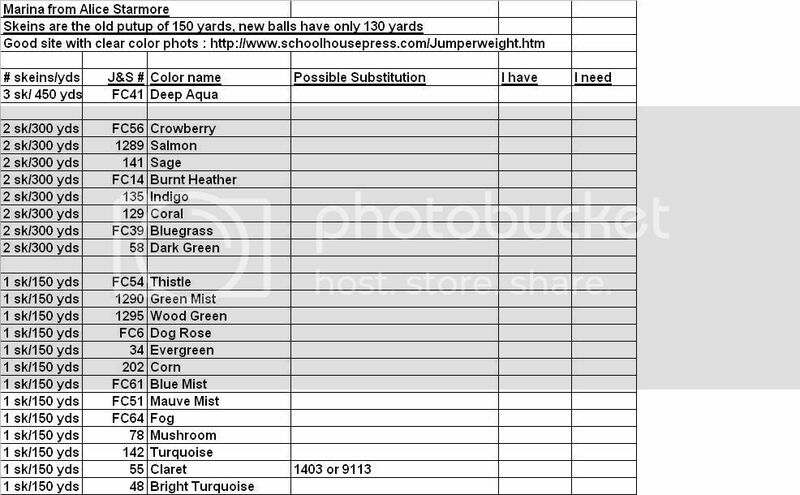 Here is a spread sheet you can copy for your planning needs. When you print this, set your printer to landscape mode to get all the columns. It will print out darker than it appears on the screen and you will be able to read all the info. It is always hard chosing the next project since you live with it a long time!